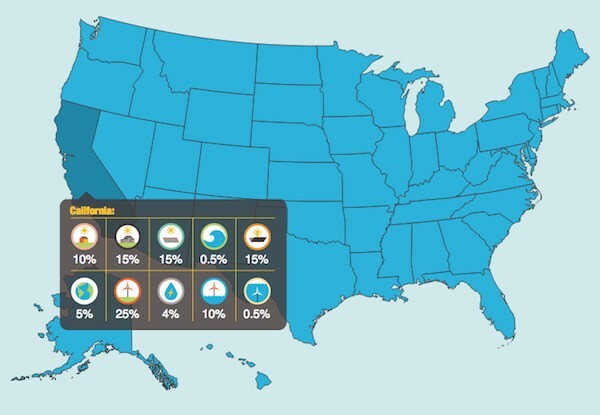 Contrary to the claims of many naysayers, a Stanford University research team led by civil engineer Mark Jacobson has developed a thorough plan for the development of 100% renewable electricity in every state in the US, using currently available technology. The research concluded that powering the United States with 100% renewable energy by 2050 is both technically and economically feasible. Furthermore, the plan doesn’t include implementing widespread energy efficiencies (although there would certainly be efficiencies with the new system), and it doesn’t include the use of biofuels or nuclear power. The plan is aimed at eliminating the burning of fossil fuels for energy. The bulk of US electricity would be supplied by wind, water (including tidal power), and solar power by 2050; some geothermal power is also included. The plan includes transitioning to electric or hydrogen-powered vehicles. Heavy industry would use electricity or hydrogen combustion. An interactive roadmap has been developed to demonstrate the viability of 100% renewable energy use in each state. Far from being too expensive to implement, as naysayers often argue, according to the research the new energy system would cost the average American electricity consumer a lot less than the price of fossil fuel-based power by 2050. This is largely because the fuel for renewable energy is free (and keeps rising for fossil fuels), so as the infrastructure is built, prices would decline. The plan also claims it will save the United States a great deal in looming climate change and pollution-related costs every year. I would feel a lot more comfortable in the viability of Dr. Jacobson’s plan if it was reviewed by peers in the energy sector, not just other climatologists.